I can’t speak to the cars, but when it comes to the coffee, it’s a small but lovely place. There’s an outside patio, which has the bulk of the seating, something you could only get away with in a climate such as Arizona, while inside there are a pair of small rooms, one with the counter, the other with some seating. The coffee, which is from San Cruz’s Verve Coffee Roasters, comes either via a simple espresso-based menu or there’s bulk-brew. February 2019: I’ve updated my piece on Fourtillfour, which has recently started roasting. This is the original write-up, published in March 2018. For an up-to-date description, please see the updated post, while you can see what’s changed in my Coffee Spot Update. Fourtillfour sits on the corner of East 1st Avenue and North Marshall Way at the heart of Old Scottsdale, an area worth exploring in its own right. Fourtillfour shares a building with The Whitehouse Studios, which is on the left as you look at it from 1st Avenue. Meanwhile, off to the right, along the side of the building, is a large, raised concrete patio, which is maybe twice as deep as it is wide, where you’ll find the bulk of the seating. Since it’s north-facing, it’s reasonably well-shaded, particularly in the morning, making it an ideal spot to sit and drink your coffee (unless you want to go sunbathing). Steps lead up to it from the front, while at the back on the right, another set of steps lead up from Marshall Way. A small bar that doubles as a barrier, runs around the front and right-hand side between the two sets of steps. You can sit here on one of eight remarkably-comfortable plastic stools. There are four tables arranged in a square, two high two-person tables with stools in the centre and two low two-person tables with chairs against the wall on the left, the most shaded spot on the whole patio. At the back, running maybe half the width of the patio, is a large room, open to the front, which contains the counter at the back, but with is otherwise rather sparse. There’s a door on the right which leads to the steps down to Marshall Way, while against the left-hand wall is a takeaway station and the only seating in the shape of two low stools. At the back, just before the counter on the left, a doorway leads into a second, slightly larger room. This has a handful of chairs around the walls and, against, the front wall, a large sofa. You can also get into Fourtillfour through here, a door on the opposite side leading into a corridor by the design studio. I had a lovely, sweet well-balanced espresso pulled on the La Marzocco GB5, and got chatting to Nico and Mia, who opened Fourtillfour at the start of 2016, although the company has been going since 2007. They told me about the car side of the business, with the two mutually supporting each other, particularly at weekends. Fourtiilfour runs a Porches + Coffee event on the first Saturday of each month, an Adventure Mobiles + Coffee event on the last Saturday of each month and a Vintage European Car Club every Sunday, all the events running from 8 – 11. The rest of the time, you can just swing by for good coffee and great company. 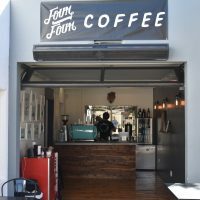 March 2018: When I visited in February, Fourtillfour was using San Francisco’s Four Barrel, although Nico and Mia were in the process of chosing a new roaster. I popped back in March to find that the decision had been taken and Verve was now in the hopper. I had a lovely shot of the Streetlevel blend, which, I believe, will be the house espresso for the foreseable future. A lovely, well-balanced shot, expertly pulled by the equally lovely Jess, who served me that day. You can see what local coffee blogger, Coffee Ken, made of FourtillFour. I still can’t believe I got there before him! Also, if you liked this, then don’t forget to check out the Coffee Spot Guide to Phoenix for more great Coffee Spots.